Over the past ten years, several of my husband’s and my relatives have relocated to Portland, Oregon, and every time I go to visit, I am reminded of how incessantly nice everyone is. As well as being way cooler-looking than me. Not to mention laid-back and colloquial. Other than all that, I usually have a great time. I have nothing against niceness in small doses. In fact, I appreciate it – it keeps the planet from becoming a bunch of puppy-kicking public belchers who wear large, obtrusive hats to the theater. But, after enduring a week of being surrounded by folks (nice people are also known as ‘folks’) who were randomly helpful enough to turn around in a crowd and supply me with a forgotten line to an obscure 1950’s musical song I had been singing (to myself), it became a bit unnerving. 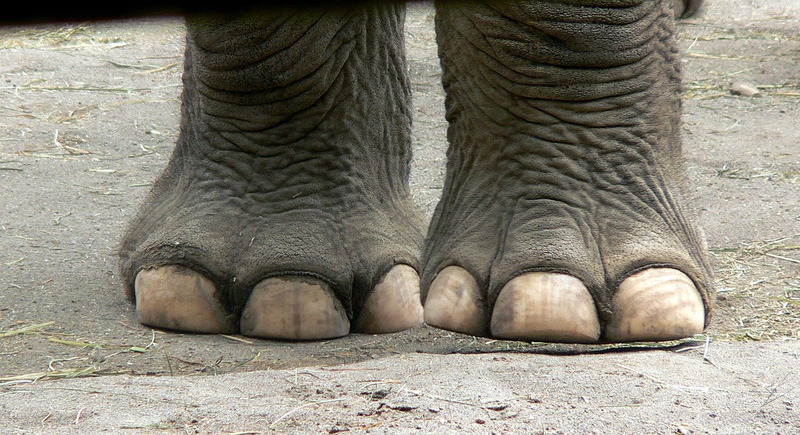 Not to mention, it forced me – a native New-Yorker who keeps her eyes averted in elevators and sometimes forgets jay-walking is a crime – to examine my own typical behaviors in public and find them greatly lacking. Later, as I ducked into a pharmacy to grab an item I’d forgotten to pack, I noticed the long line at the register and groaned some obscenity under my breath. The woman standing in front of me turned and suggested I go ahead of her with my single item. How nice! “In fact,” she said brightly, glancing over at the pharmacy counter, “I’ll bet you could pay for that over there. There’s no one there right now.” How nice! (But, if you say it so loud, everyone will hear!) At the pharmacy register, the cashier looked briefly troubled. “Well, we’re not really supposed to ring up regular items here, but if it’s only one item…and if you can keep it a secret…” she smiled and winked. I winked back…..and immediately asked if I could add a pack of gum to the sale. In theory, being nice usually goes along with a certain aesthetic. Little old ladies with cats are generally nice. Boy scouts are nice. So, it’s even more distressing when I am forced to deal with nice people who don’t fit the stereotypical visual. If I had a dime for every person with full tattoo sleeves and multiple facial piercings merrily pushing their child in a stroller down the street where I live in the suburbs of Washington, DC – well, I’d be broke. But, Portland seems to thrive with a plethora of parents who fly their freak flags loud and proud. Back at the bottom of Capital Hill, where most moms fit a mold of age-appropriate highlighted lobs and sensible flats, I am considered to be a bit of a radical myself, what with my three tattoos that actually poke their way out of my shirt sleeves on occasion. But, I felt like such a conservative Republican walking through the streets of Portland amongst the purple-haired, tatted-up moms and dads, I sensed the need to surreptitiously pull my sleeves up a bit higher just to broadcast my own fairly small badge of inked simpatico style. “I’m cool, too,” I tried to remind myself. In fact, I once owned a pair of Dr. Marten’s. Other than being nice, Portland is known for being weird. 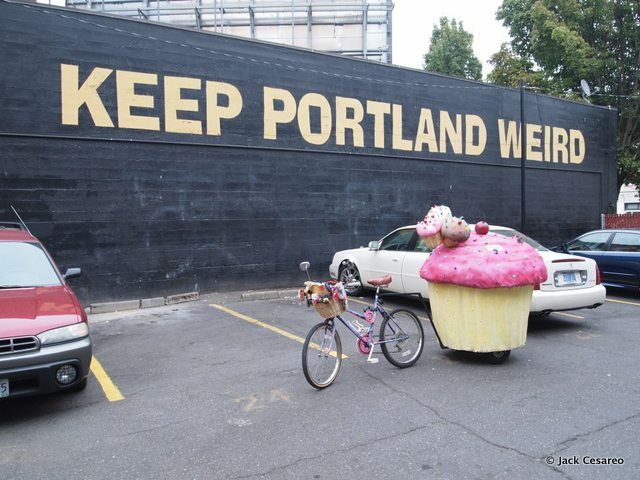 It’s a directive they promote on billboards and buses – “Keep Portland Weird.” I’m not sure what kind of tax breaks or government-funded incentives the denizens are offered to keep their city weird, but it seems to work in subtle ways to ensure the city lives up to its motto. East Coast/West Coast grammatical differences notwithstanding (I prefer to stand ‘on line’ rather than ‘in line’, much to the horror of the local Target clerk to whom I mentioned it), my husband and I witnessed several weird behaviors during our Portland trip. At the Apple Store, the only sign the salesman gave that he noticed the loud and slightly belligerent homeless man wandering around behind him was to raise his voice ever so slightly as he continued to point out the features of the latest MacBook Pro. While parallel parking on the street, we were reminded by a rather formal young man walking out to the car behind us that, ‘just for the record’, he needed more room to back up. At a coffee shop, while waiting for our order, several bundled-up Sunday morning customers remarked about how cold the weather was. The clerk behind the counter agreed, adding “It’s like someone stole the big warm blanket that’s usually up in the sky to keep us comfy and safe from the cold.” I gave my husband a wry smile at this point; surely that comment would be considered weirder than normal – even here. But instead of eyebrow furrows and stares, the other patrons nodded sagely, no doubt mulling over the necessary thickness of such an astral shroud. I’m sure if I spent more than a week in Portland at any given time, I would grow more accustomed to the niceness and weirdness. Probably the weirdness more than the niceness. I’m kind of weird myself, but I’m definitely not that nice.